Weekly podcast discussing mead, mead making, meaderies and mead info from around the world. 4-16-19 We're bringing Steve Patik back to talk about braggots tonight. Braggots are very popular, and there are many ways to approach them. I've had stout-style braggots, and ale-style braggots, and everything in between, and there are a million ways to make them. Steve is a big fan of braggots, and has made many. We're going to be talking about best practices for braggots, preferred yeasts, fermentation techniques and what potential problems can crop up when making them. Steve Patik lives in Colorado with his wife and two daughters. He found a passion for Mead over a Thanksgiving table in 2012 and year later decided to try his hand at making this amazing beverage. For over 5 years, Steve has been making mead and doing so in some unconventional, yet successful, ways. Steve rarely has a mead that is older than six months and he has won awards for mead that was only 6 weeks old. As a successful amateur Mead maker, Steve consistently shows his talent at competitions locally and nationally by taking a place or even a Best of Show once in a while. The meads Steve enjoys making the most are traditionals and braggots. So, what is his secret? Steve believes in the marriage of best practices, modern techniques and top shelf ingredients. Click the chat link to join us in the live conversation during the show. This player will show the most recent show, and when we're live, will play the live feed. If you are calling in, please turn off the player sound, so we don't get feedback. Click here to see a playable list of all our episodes! 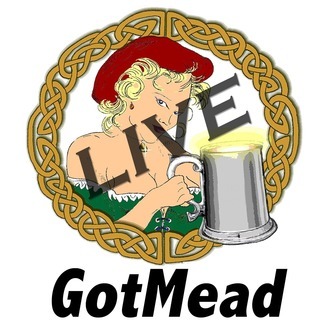 If you want to ask your mead making questions, you can call us at 803-443-MEAD (6323) or send us a question via email, or via Twitter @GotmeadNow and we'll tackle it online! 9PM EDT/6PM PDT Join us on live chat during the show Bring your questions and your mead, and let's talk mead! You can call us at 803-443-MEAD (6323), or Skype us at meadwench (please friend me first and say you're a listener, I get tons of Skype spam), or tweet to @gotmeadnow. Show links and notes Beersmith software Designing Great Beers by Ray Daniels Let There Be Melomels by Rob Ratliff The Big Book of Mead Recipes by Rob Ratliff Upcoming Events April 18 - Charm City Meadworks - playing Monty Python's Life of Brian April 20 - St. Ambrose Meadery - Barefoot playing April 24 - Schramm's Mead - Mazer Club Heather Reception May 9 - The Royce Detroit - The Compleat Introduction to Mead with Ken Schramm May 24-25 - Wild Blossom Meadery and Winery - Singles Mingle Event June 1 - Warped Pours II - Pour Harder - Metro South Homebrew League Homebrew Festival June 27 - Brother's Drake Mead - The Bee's Meads at the Conservatory July 27 - Orcas Island Cider and Mead Festival Got an event you’d like us to mention on GotMead Live? 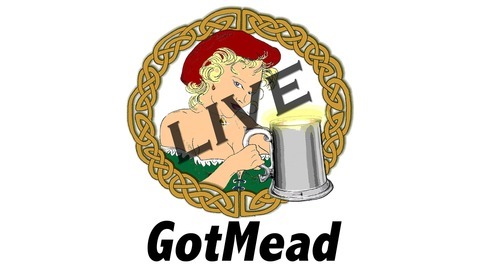 Send us an email at gotmeadlive@gotmead.com and tell us about it!